Dragonfruit, aka pitaya, is often cultivated by cuttings but may also be grown from seeds. Propagation from seeds is by far the easiest method to attempt, however success is sometimes hard to come by. Dragonfruits are filled with tons of small black seeds that are edible, just as those in a kiwi, and germinate readily from fresh fruit. It should be noted that taking good care of dragonfruit seedlings proves to be a challenging endeavor without the correct environment. Firstly you must obtain a dragonfruit, cut it open, and begin to harvest the minuscule seeds. Try carefully to collect only the seeds and not the surrounding flesh. Then, if possible, you should rinse the seeds and clean them of the sugary flesh and juice that has the potential to lead to rotting and disease during the germination process. I use a metal tea strainer to do this, rinsing several times while removing any visible pieces of flesh. For maximum germination rates, spread the cleaned seeds evenly across a moist paper towel, fold and place it in a bag and keep them in a warm spot for a few weeks. Once roots begin to emerge, you may transplant the seedlings into soil pots filled with a typical cacti soil mix or one with a mix of vermiculite, perlite and peat moss. Alternatively, cleaned seeds may be sowed directly in a potting mix (at a shallow depth of ~ 1/16in. ), however often with decreased success. 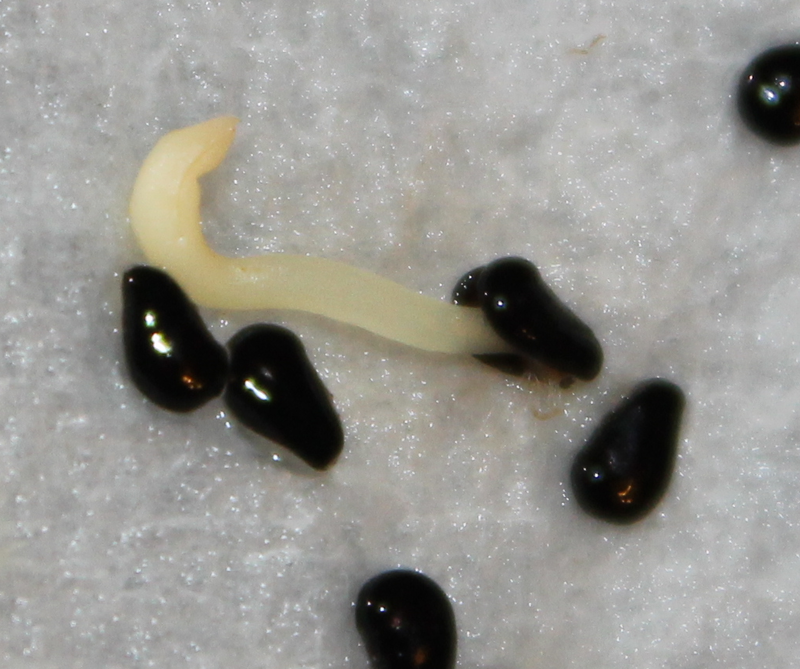 Once germinated, seedlings will send out relatively long white roots, at which point they should be transplanted. If allowed to grow too long, the roots will become entangled in the paper towel and damage will be inevitable. The seeds require somewhat bright light during the day, this can be provided by a full spectrum lamp or from sunlight coming through a window. A humidome or plastic covering will keep in crucial humidity while still allowing the soil to dry out slightly. If grown outside in full sun, the seedlings will benefit from a little bit of shade and protection from the elements. The most tricky part of growing dragonfruit from seed is getting passed the cotyledon stage of growth. The seedlings are very small and delicate, especially prone to root rot. Be careful not to water too much, and if you notice seedlings dying with shriveled brown roots you need to start watering less - this may also be an indication of poorly draining or compacted soil.